The Philharmonic Society gratefully acknowledges Joan Halvajian for her generous sponsorship of this afternoon’s performance. Orchestration: piccolo, 2 flutes, 2 oboes, English horn, 2 clarinets, bass clarinet, 2 bassoons, 4 horns, 3 trumpets, 3 trombones, tuba, timpani, percussion (cymbals, bass drum, snare drum, tam-tam, triangle, xylophone), strings, and solo organ First Los Angeles Philharmonic performance: May 18, 2007, with organist Simon Preston, Alexander Mickelthwate conducting As large organs became more common in new concert halls in the later 19th century, a modest repertory of celebratory music for organ and orchestra also began developing. Perhaps the most exuberant of all such pieces is the Toccata Festiva Samuel Barber composed for the inauguration of a new organ at the Academy of Music in Philadelphia. Mary Curtis Zimbalist, a friend and patron of the composer since his youth at the Curtis Institute, funded the organ and also commissioned this piece. Paul Callaway, the organist and music director at the National Cathedral in Washington, D.C., played the organ at the premiere in September 1960, with Eugene Ormandy conducting the Philadelphia Orchestra. Barber shapes his piece much like the first movement of a typical Romantic concerto. It begins boldly, with an edgy, rushing fanfare in A minor, introduced by the orchestra, then picked up by the organ. At the end of this opening section the organ presents a dotted-rhythm figure in 5/8 meter that will become very important. Here, it leads into a slow, lyrical theme, first in the strings, then the organ. The little dotted figure begins to make its presence felt, however, as a quietly dancing countermelody. Listen to it on the organ’s reed pipes, then in the orchestra’s English horn. Barber treats solo instruments in the orchestra like solo stops on the organ, and vice-versa, making the combination into a sort of über-organ. I have wanted to compose a symphony for organ and orchestra since I first started to write music at the age of ten. Thanks to the kindness and support of the Los Angeles Philharmonic, and the Philharmonic Society of Orange County, I was not only able to realize this dream but to sketch a good deal of the organ part at the console of the Walt Disney Concert Hall organ, exploring its wonderful array of unique timbres. In casting the piece as a symphony with organ, it was my aim to use it as an integral part of the orchestral fabric, a fifth choir contributing special colors in the way only it can. The swirling fanfare returns, ushering in a section that develops and mixes all the motivic elements in a flurry of metrical and rhythmic games. As another example of Barber’s ideas about solo scoring, there is a trumpet call in the organ with cues in the orchestral trumpet part (for performances with an organ lacking a strong trumpet stop). The middle section begins with a high, quiet chorale for the strings and then yields to a scherzo-like movement featuring the organ in its highest register. Gradually, new ideas enter that seek to push aside the initial theme. What has begun with a certain degree of lightness and innocence becomes more restive, and even violent. A brief respite appears in a calm theme for the quartet of trumpets, but the growing upheaval reasserts itself and brings the section to a brief fortississimo conclusion. was often a type of orchestral song; a quick scherzo, usually a humorous dance; and a finale commonly composed as a sonata-rondo, a lively and lighter embodiment of sonata form principles. In his Third Symphony, Saint-Saëns condensed these movements into two, eliminating sections that would have repeated material. After a brief, slow introduction, his opening movement begins as a sonata form. But at the point where a typical sonata movement would have begun recapitulating the original thematic materials, Saint-Saëns instead moves directly into a slow movement in the remote key of D-flat major. This may sound dauntingly technical, but in sound the moment is impossible to miss, as the organ makes its first entrance, soft and low, and the strings slide in with lyrical bliss. Serenity replaces neurotic urgency as the movement grows to euphoric heights. The Los Angeles Philharmonic was founded by William Andrews Clark, Jr., a millionaire and amateur musician, who established the city’s first permanent symphony orchestra in 1919. Walter Henry Rothwell became its first Music Director, serving until 1927; since then, ten renowned conductors have served in that capacity: Georg Schnéevoigt (1927-1929); Artur Rodzinski (1929-1933); Otto Klemperer (1933-1939); Alfred Wallenstein (1943-1956); Eduard van Beinum (1956-1959); Zubin Mehta (19621978); Carlo Maria Giulini (1978-1984); André Previn (1985-1989); Esa-Pekka Salonen (19922009); and Gustavo Dudamel (2009-present). GuSTAVO DuDAMEL, CONDuCTOR Gustavo Dudamel is defined by his untiring advocacy of access to music for all. As a symphonic and operatic conductor, his music making on four continents continues to inspire audiences of all ages. He is currently serving as Music Director of both the Los Angeles Philharmonic and the Simón Bolívar Symphony Orchestra of Venezuela, and the impact of his musical leadership is felt internationally. While his commitment to these posts accounts for the major portion of his yearly schedule, Dudamel also guest conducts with some of the world’s greatest musical institutions. This season he returns to the Berlin Philharmonic, Berlin Staatskapelle, Gothenburg Symphony, and Tonhalle Orchestra Zürich, and to the Vienna Philharmonic in Vienna and Salzburg as well as on tour through Europe and Asia. ing an extensive catalog of recorded music, and broadcasting concerts on radio and television. Through an ongoing partnership with Deutsche Grammophon, the orchestra also has a substantial catalog of concerts available online, including the first full-length classical music video released on iTunes. In 2011, the Los Angeles Philharmonic and Gustavo Dudamel won a Grammy for Best Orchestral Performance for their recording of the Brahms Symphony No. 4. An exclusive Deutsche Grammophon artist since 2005, Grammy-winner Gustavo Dudamel has numerous recordings on the label, as well as many video/DVD releases that capture the excitement of significant moments of his musical life. He is one of the most decorated conductors of his generation; recent distinctions include the 2014 Leonard Bernstein Lifetime Achievement Award for the Elevation of Music in Society from the Longy School, 2013 Musical America’s Musician of the Year and induction into Gramophone Hall of Fame, 2010 Eugene McDermott Award in the Arts at MIT, 2009 Chevalier de l’Ordre des Arts et des Lettres and one of TIME Magazine’s 100 most influential people, 2008 Q Prize from Harvard, along with several honorary doctorates. Gustavo Dudamel was born in Venezuela in 1981. Access to music for all has been the cornerstone of Gustavo’s philosophy both professionally and philanthropically. herself as a house favorite at leading opera companies on both sides of the Atlantic. Since her critically acclaimed debut at the Deutsche Oper Berlin in the fall of 2008, Stober has cultivated a relationship with the company, appearing in a variety of leading roles, including Pamina in Die Zauberflöte, Micaëla in Carmen, Susanna in Le nozze di Figaro, Adina in a new production of L’elisir d’amore, Gretel in Hänsel und Gretel, Oscar in Un ballo in maschera, Nanetta in Falstaff and Princess Ninetta in Robert Carsen’s new production of Prokofiev’s L’Amour des Trois Oranges. critical acclaim as Sophie in Werther, which was followed by performances of Susanna in Le nozze di Figaro and a highly acclaimed Pamina in a new production of Die Zauberflöte. Solidly established as a house favorite at Houston Grand Opera, in addition to Xerxes, Stober has appeared as Susanna, Blondchen in Die Entführung aus dem Serail, Drusilla in L’incoronazione di Poppea, Norina in Don Pasquale, and Musetta in a new production of La bohème. Her 2007 debut as La Folie in Platée with the Santa Fe Opera was a particular success, leading to a continuing relationship with that company in such roles as Tigrane in Handel’s Radamisto and Musetta in La bohème, and Ada in the world premiere of Oscar. She made her role debut as Leïla in Les pêcheurs de perles with Opera Colorado, her South American debut with Teatro Municipal in Santiago as Morgana in Alcina, and role and house debuts with Opera Theatre of St. Louis as Aminta in Mozart’s Il re pastore. The New York Times wrote of her New York City Opera debut that she “contributed some remarkable singing” as Poppea in Handel’s Agrippina. Stober made early appearances with Boston Lyric Opera, Wolf Trap Opera, Central City Opera, and Utah Opera. 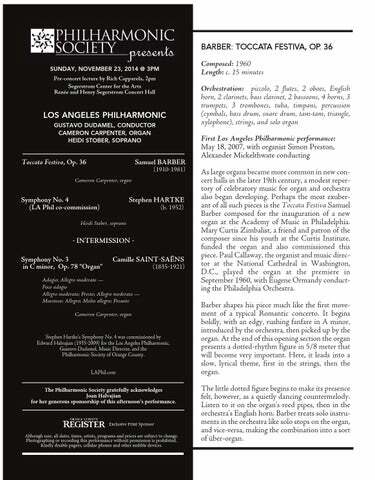 Highlights of concert engagements include Mozart’s Requiem with the Los Angeles Philharmonic, Mahler’s Symphony No. 4 (Edo de Waart, conductor) with the Milwaukee Symphony Orchestra, and the role of Anne Trulove in The Rake’s Progress with the St. Paul Chamber Orchestra. Additional concert work includes Barber’s Knoxville: Summer of 1915 with the Oslo Philharmonic, Beethoven’s Symphony No. 9 with the Baltimore Symphony, Brahms’ Ein deutsches Requiem with the Houston Symphony, Handel’s Messiah with the Hong Kong Philharmonic, and Carmina Burana with Houston Ballet. Heidi Stober’s professional training took place at the Houston Grand Opera Studio, and she holds degrees from Lawrence University and the New England Conservatory. She and her husband, baritone Simon Pauly, currently make their home in Berlin with their son. For more information about Heidi Stober, please visit heidistober.com. PERCUSSION Raynor Carroll Principal James Babor Perry Dreiman KEYBOARD Joanne Pearce Martin Katharine Bixby Hotchkis Chair HARP Lou Anne Neill LIBRARIANS Kazue Asawa McGregor Kenneth Bonebrake Stephen Biagini PERSONNEL MANAGER Jeffrey Neville PRODUCTION DIRECTOR Paul M. Geller CONDUCTING FELLOWS Christian Kluxen Gemma New The Los Angeles Philharmonic string section utilizes revolving seating on a systematic basis. Players listed alphabetically change seats periodically. In those sections where there are two principals, the musicians share the position equally and are listed in order of length of service. 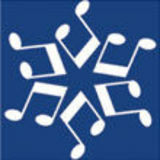 The musicians of the Los Angeles Philharmonic are represented by Professional Musicians Local 47, AFM.